The Erzgebirgsstadion opened in 1950 under the name of Otto-Grotewohl-Stadion. It was built at the site where before the old Städtisches Stadion had stood. The stadium officially opened on the 20th of August 1950 with a match between Erzbergbau and Waggonbau Dessau (3-3). It could hold about 25,000 spectators at that time. Over the years the stadium underwent several renovations, the first in the late 1980s, and later in 2004 and 2010. This gradually reduced capacity to its current number. In 1991, the stadium got renamed Erzgebirgsstadion. Twenty years later, in 2011, the sponsor name Sparkassen was placed in front as part of a naming rights deal that will last until 2020. In 2016, the club started a redevelopment project that is to turn the Erzgebirgsstadion into a modern stadium. First stands to get rebuild are the West and North Stand, followed by the other two once those are finished. Capacity will rise to about 16,500 places. 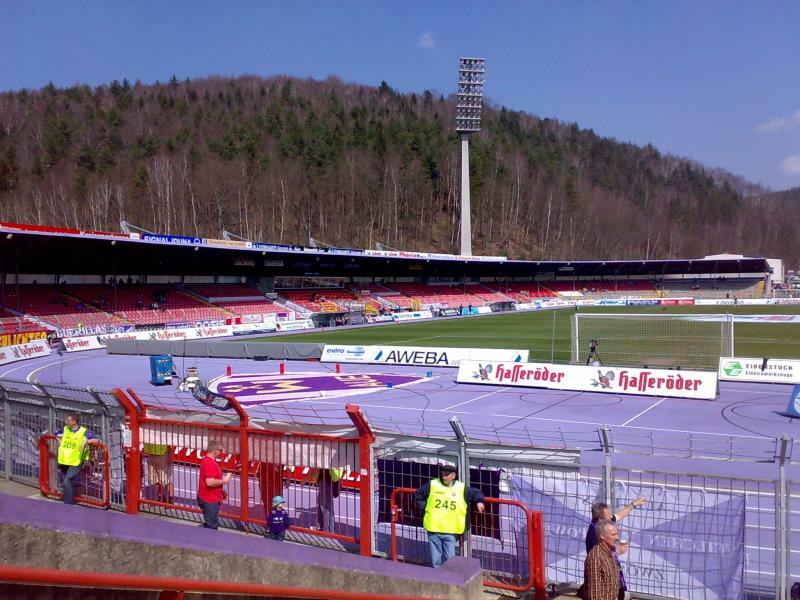 The Sparkassen-Erzgebirgsstadion is located in the north of the small town of Aue, a short 15-minute uphill walk from the railway station and town centre. 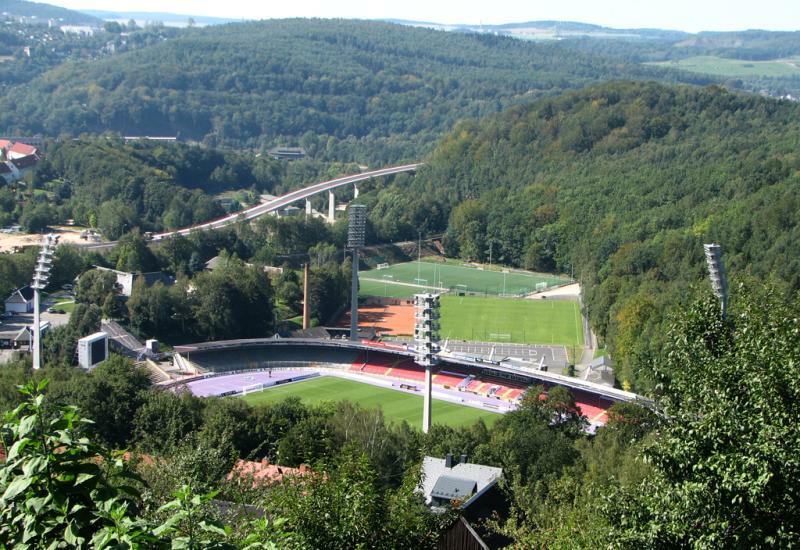 The stadium is picturesquely surrounded by the rolling green hills of the Erzgebirge (Ore Mountains). The town of Aue can be reached with regional trains from the cities of Zwickau and Chemnitz, which have connections to larger cities in the east of Germany such as Dresden, Leipzig, and Nuremberg. Tickets for Erzgebirge Aue games can be bought online, by phone +49 (0) 341 – 33 17 36 33, at the Fan Shop at the stadium, at the Fan-Project at the Bahnhofstr. 37 in Aue’s town centre, or at one of the other authorised sales points. Tickets can also be bought at the gates of the stadium on the day of the match. Aue will only sell out the occasional high-profile match. A ticket for one of the standing areas cost €12.00 or €13.00. A seats costs €22.00 or €24.00. 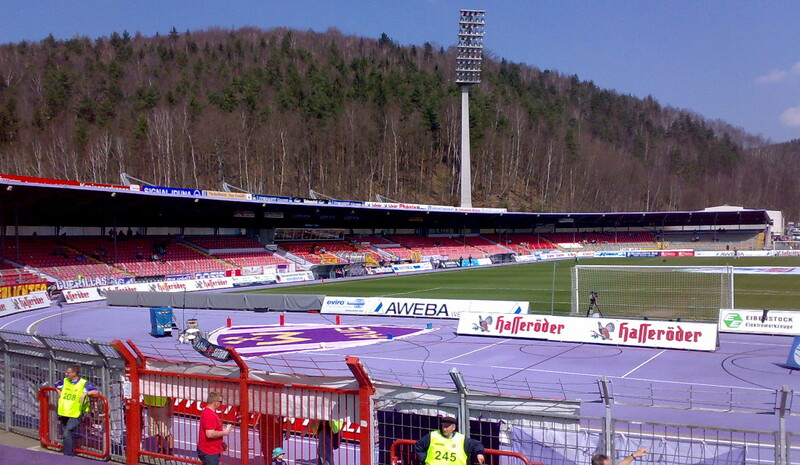 Fc-erzgebirge.de – Official website of FC Erzgebirge Aue. Erzgebirge-tourismus.de – Tourism information for the Erzgebirge area.